There are many times when I'm out in nature and I have an urge to get closer to a particular tree, plant, or flower. One of my five senses are activated as I smell a sweet scent; I heard a soft sound; I see a different colour or object; I feel a tingling sensation on my skin; or I taste a sugary flavour in the air. All of these things guides me to something wonderful. There are even times, when I feel a flutter in my heart that excites my inner child. When I allow my inner child to get closer to an object I feel excited and more inquisitive. As I follow my impulses, I ended up finding some amazing things. Here are a two examples of my interaction with nature. I filmed this video back in May of 2015, where I noticed the light green needles on the tree. As I looked that them I felt guided to touch the soft needles. After watching the video, I realized that I sang to the tree unconsciously, which is something that always delights me. In addition, I watched the film a few more times and I noticed that there were 3 different little lights moving quickly away from the needles before I touched them. Oh... I wonder what they can be. Maybe nature spirits? 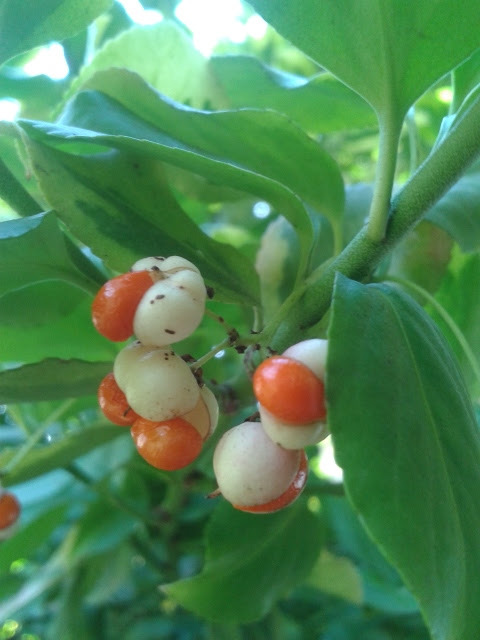 This past November, I was visiting a friend's home and I noticed some orange and white berries on a plant outside her house. I had an urge to take some pictures but I did not do it at the time. 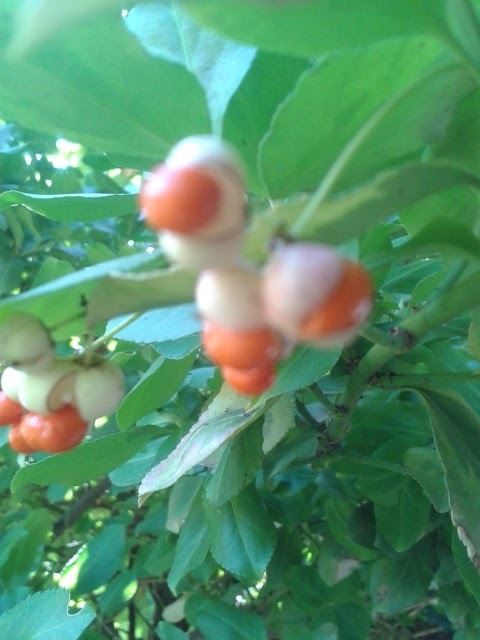 Once I got home I asked my friend to text a photo of the orange and white berries outside front door. At first she had no idea what I was talking about. She only noticed purple berries at the front of her walkway. She lived there for many years and it was the first time she noticed them. Once she found them, I asked her to post a picture of the berries on my Facebook wall. This is what she wrote: "Berries on my porch that I did not see. What other treasures are there to discover? Thanks Naomi Benoist for bringing them to my attention!" Although I loved the photo my friend sent me, I had an urge to return to take a few pictures myself. I couldn't get the berries out of my mind. I felt called to them. After a few days, I found myself outside her home again and I took the pictures below. I enjoyed the colours so I've kept them on my cellphone for months. Just recently, I showed these photos to another friend and I noticed a blue coloured orb. HA! Now look at that! In the first photo there is one light blue orb above the berries. If you look closer you can see another light blue orb hiding behind the stem of one of the berries. The more you look at the photo you might noticed there were blue, green, and white orbs around the plant. HA! Although this second photo is a bit off focus I decided not to delete it. In this photo there is an arch of little lights over the second set of berries. Of course one could say that the lights are just coming from the sunlight but it's nice to think that they could be fairies dancing in the background. Oh how nature spirits love to play!